Suzuki Karimun Wagon R appears to be one of the unique contender in this segment. Figure in the form of a mini MPV (or wagon), is different from rivals that comes with a hatchback that Suzuki did not hesitate dubbed 'SUPER' (Spacious, Useful, Practical, Efficient, reasonable). Karimun figure GX Wagon R type - the type of top. The corners of the tinkering seems to be a 'real descendants' genealogy in Karimun. But without any measurement, you can see that the Karimun Wagon R appear in a dimension much smaller, sleeker, and has a higher ground clearance than the first generation. No longer a small glass in the car like its predecessor the C-pillar. At the front there is a 'blue eyes' in the headlights, and in the front bumper are fog lamp holder can be installed as optional accessories. When viewed from the side the shape of the car looks a little 'uphill', as well as when viewed from the rear. Yet this form in the end makes it easy to access the luggage Karimun whose size seemed quite roomy in its class. 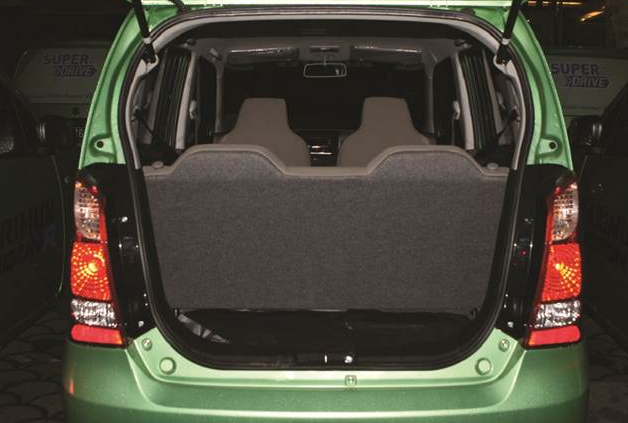 Its capacity can also be increased by folding the rear seat. Unfortunately the rear glass defogger or wiper not fitted. The interior is bright with impressive cream-colored upholstery and two-tone dashboard. Its upholstery fabric soft and comfortable, with a high seating position that visibility to the front too freely. In the back row, there is not cramped leg room and head room is plentiful thanks to the high roof of the car. Unfortunately the seat is not fitted with headrests. Double-DIN audio system can be entertained during the trip as it can play music from a variety of media. Interestingly, for the type GX front passenger seat cushion can be removed and available behind the additional compartment large enough to store valuables. 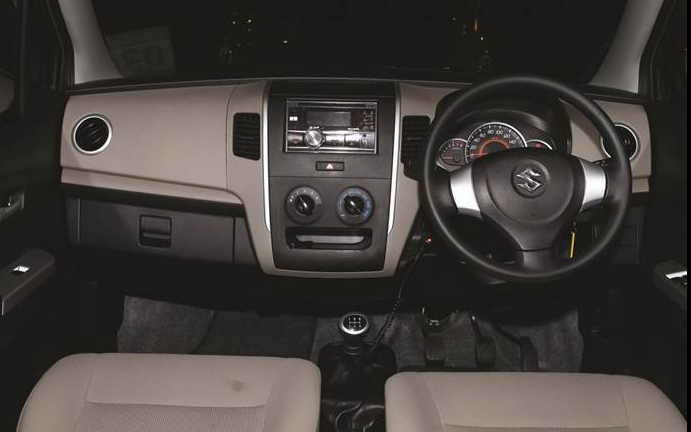 Although the front passenger leg room a little disturbed bulge wheel house, movement of the foot still feels free as under the dash there is no bulkhead between the passenger and driver's leg room. We began to try, we had doubts about the performance of the 3-cylinder engine capacity of 998 cc K10B coded this. The engine offers 67 hp peak power and maximum torque by 90 Nm paired with a five-speed manual transmission as the only option. This combination is ideal for the arguably offers responsive acceleration in the middle of traffic density Capital City we passed along the way. 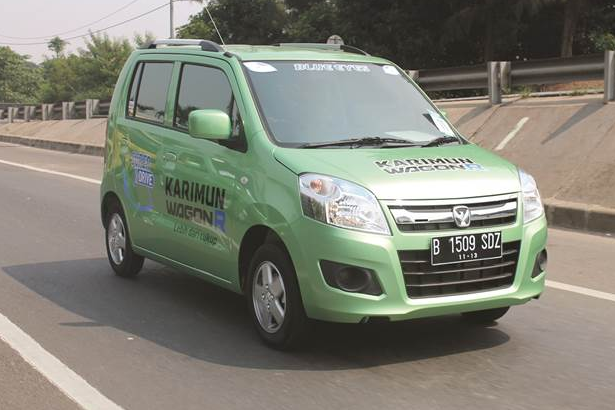 Not only that, Karimun also feels easily reach speeds of 140 kph when driving on the freeway. this helped the car weighs only 825 kg in a discharged condition. One of the added value offered by Karimun Wagon R this is the Gear Shift indicator that shows when the ideal time to move the teeth for the sake of fuel efficiency. Steering system that has been using an electric power steering has a weight steady rotation. Karimun turning radius Wagon R is just 4.6 m makes it agile in maneuvering in the crevices of congestion, while spinning, or when parking. Macpherson strut front suspension and rigid 3-links at the rear gives a pretty good attenuation as it passes through the potholed streets on the outskirts of Jakarta. Of special note is given on the braking system with disc brakes on the front and drums at the rear of the perceived less vigilant in stopping the car's speed, even in low speed. Overall, despite initially slogan "More Than Enough" sounds so superior to a product LCGC, but for us Karimun Wagon R has a commendable effort to bear the slogan. 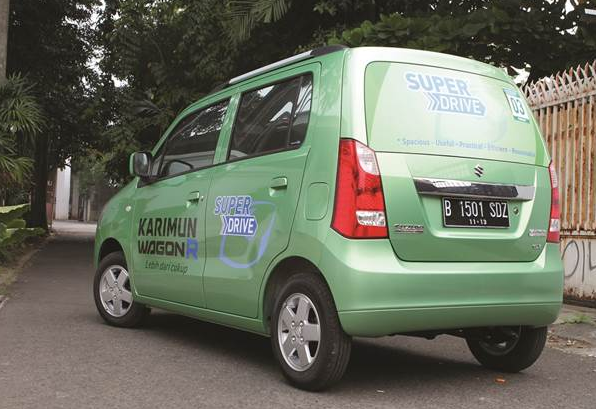 Not one hundred percent perfect indeed, but a good track record in the completion of Suzuki products several years ter the end makes us quite confident that Karimun Wagon R may be following the success of Suzuki Ertiga.